The Viking Market in Frederikssund, Denmark, has is held as a start of the Viking Plays in Frederikssund. The amateur theatre has been shown every summer in the town of Frederikssund in more than 50 years. It involves hundreds of people working as volunteers. 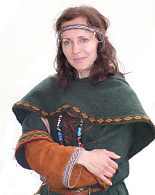 The Viking reservation Foteviken in Sweden is having its Viking Viking Market in June. The market has an international touch with Vikings from many countries around the Baltic Sea, including Poland, Russia and Germany. Before the market there is a handwork week - closed for the public. Hafrsfjord Viking Market in Norway is held close to Stavanger which this year is European Capital of Culture.